Closing date: Applications must be received by 5pm on October 14th. 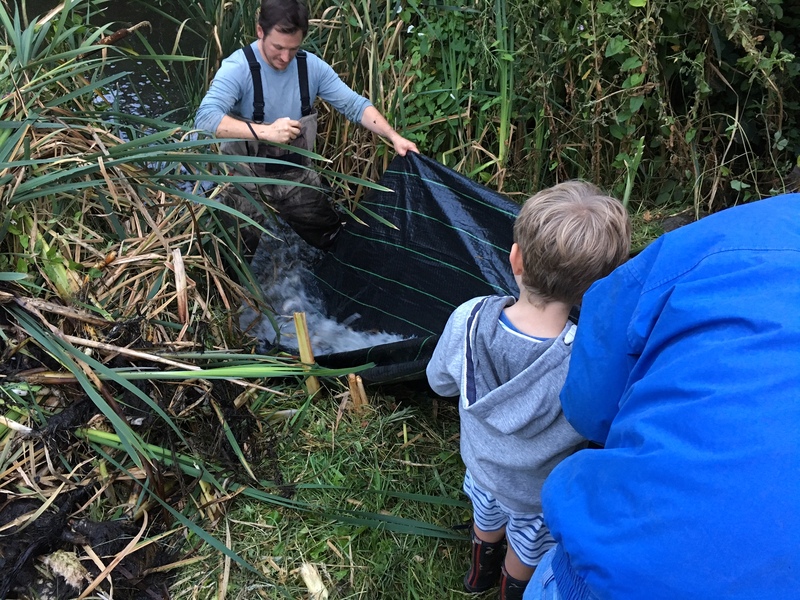 The number of projects led by Bristol Avon Rivers Trust’s has grown significantly over the last 4 years and as such the trust is looking to take on another member of staff. This role is an opportunity to join a small team with big ambitions and to help shape the future of the Trust in coming years. Prospects will depend on speed of learning and the ability to quickly help generate income whilst meeting the Trust’s charitable objectives. The main duties of the trainee Project Officer post will involve delivering and developing BART’s LoCATE Project (Local Community Action Through Education) to individuals, schools and community groups throughout the catchment. However, the successful applicant will often be required to contribute to the other activities and duties of the Trust. Develop a thorough understanding of BART’s work to date, and the issues that need to be addressed within the Bristol Avon Catchment. Identify potential partner organisations and individuals and develop working relationships with them. 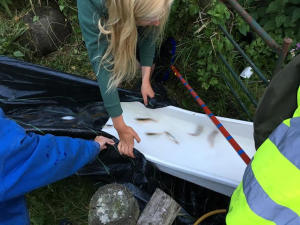 Lead BART’s LoCATE Project to individuals, schools and community groups throughout the catchment. 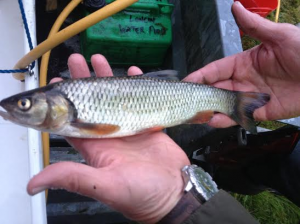 Recruit volunteers to work on catchment restoration and research activities. Develop and submit funding bids to awarding bodies. Contribute and assist in the production of publicity and marketing materials. Degree or equivalent in an environmental science. A confident and clear communicator with experience in directly delivering education & engagement activities with school children & community groups. Knowledge/understanding of riverine ecology and conservation issues. Understanding of legislation relevant to the aquatic environment (e.g. 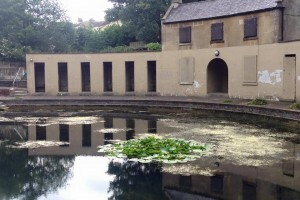 Water Framework Directive). Ability to work flexibly, including some evenings and weekends. Ability to engage and build relationships across organisations with differing objectives and priorities. Ability to prioritise and plan activities. Proven experience of generating budgets and making successful applications for project funding. Excellent literacy, numeracy and report-writing skills. Ability to work alone, with a high level of accuracy and attention to detail, and experience of using information/data to aid decision-making. Good computer literacy skills (e.g. with Excel, Word, Powerpoint and the Internet). All applicants will receive responses. Interviews for shortlisted applicants will take place in Bristol, week beginning Monday 7th November. The last month has seen two of our Riverfly Partnership monitors coming to us with a strange finding – lamprey larvae (or ‘ammocoetes’ as they are also known). One of the most primitive vertebrates alive today, lampreys are fascinating parasitic fish that are jawless and attach themselves to other fish to feed on blood and scales (although at the larvae stage they are filter feeding and not parasitic). They are similar in shape to eels and have a series of uncovered round gill openings (known as gill pores) on the sides of the head. 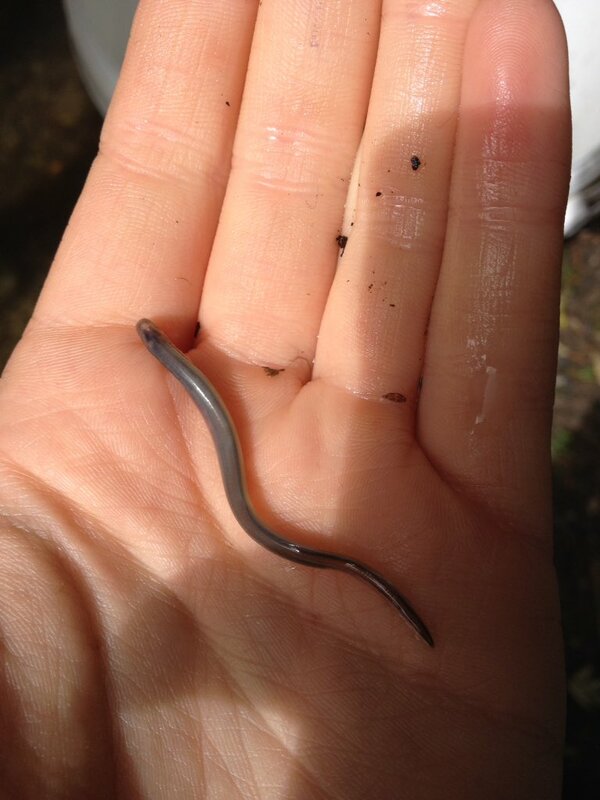 Lamprey ammocoete found on the River Wylye during a Riverly training session for the Wiltshire Wildlife Trust. Recent reports have stated that lampreys are returning to rivers where they had not been previously seen for 200 years. A combination of poor water quality, a reduction in available habitat and man-made barriers to migration are all thought to have been responsible for this decline. All of our findings have been sent to the UK Lamprey Watch, a project which has been set up to help to conserve and protect the UK’s lamprey species. Around 600 fish were removed by electrofishing and taken to a new donor pond including perch, ruffe and chub of various sizes. 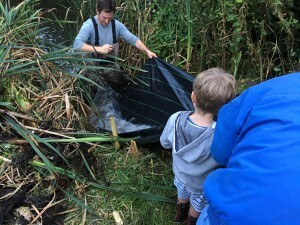 Freshwater shrimp research project – can you help? Whilst BART are out and about river dipping we often see freshwater shrimp (Gammarus) with these bright orange spots in their bodies – a sign of a spiny headed worm parasite. The Environment Agency are now asking for anyone who finds these shrimp with parasitic spots, either whilst Riverfly monitoring or playing about in streams, to send them in to the details below. This is an exciting project and we are looking forward to seeing the results! Thank you in advance for your help. 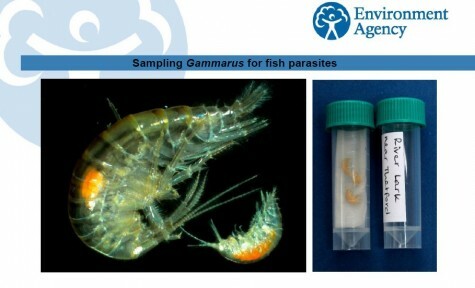 If you find any shrimps like these during your river surveys, please let us know. If possible, put a small number of shrimps into a small container with some wet tissue and send them to us at the address below. Please include the name of the river and either a grid reference or the name of the nearest town. Should you require any containers sending to you, please let us know. 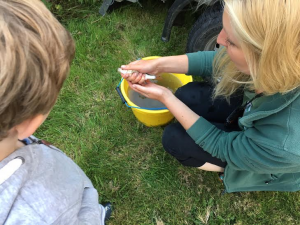 We are hoping to obtain samples of shrimps from as many rivers as we can throughout England and Wales and even a single shrimp can help provide some very useful information. Many thanks! If you have any queries or would like more information about this project, please contact: hannah.bradley@environment-agency.gov.uk.